eCompliance, a leading provider of safety management solutions, will host the first-ever conference designed to provide EHS leaders with a platform to challenge the status quo and shape the next chapter in EHS management. 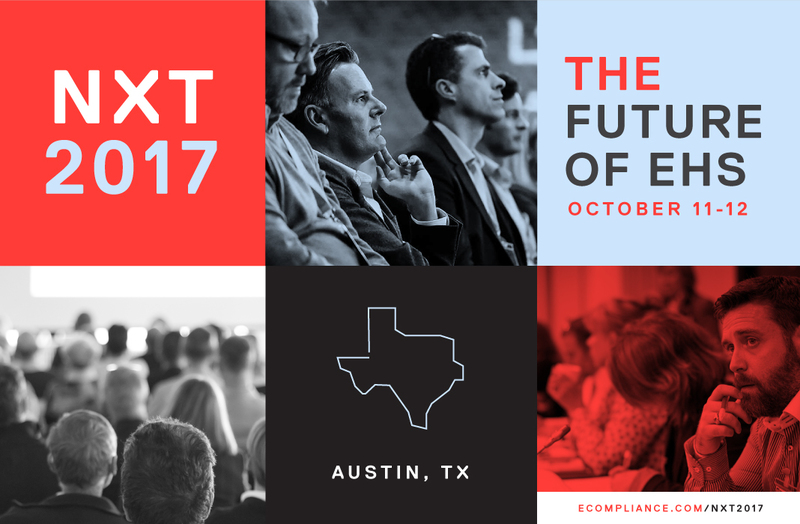 NXT 2017: The Future of EHS will be held at the Sonesta Bee Cave in Austin, Texas between October 11-12, and will bring together over 100 EHS executives interested in discussing the latest health and safety technology trends that will define the next era in safety. Attendees will have the chance to hear from industry luminaries including Rob Ellis, Founder and President of MySafeWork, Dr. Judy Agnew, Senior Vice President of Safety Solutions at Aubrey Daniels International, Davide Vassallo, Global Managing Director at DuPont Sustainable Solutions and Trevor Bronson, EHS Industry Analyst at Verdantix. NXT speakers will be sharing their insights on topics such as the evolving role of the EHS executive, the impact of artificial intelligence, IoT and preventative analytics on workplace safety, and the emerging safety methodology, participation-based safety. NXT 2017 will also serve as an opportunity to celebrate industry innovations and safety achievements and health and safety professionals are invited to enter to win an EHS Excellence Award. The EHS Excellence Awards fall into three categories: the David Ellis Award, open to applicants that have demonstrated a commitment to increasing worker participation in safety activities; the Change Agent award; open to applicants that have successfully implemented a company-wide initiative to transform their EHS program; and the Safety Nerd Award; open to applicants that have leveraged their company’s EHS data to make actionable and measurable change within their organization. Applications for the EHS Excellence Awards are due September 22, 2017. NXT attendees will also be able to participate in hands-on breakout sessions, learn tactical tips from some of the world’s safest companies and network with EHS executives at the Celebrating Safety Excellence Gala. NXT 2017: The Future of EHS tickets are already on sale here.